Today, folks, was Independence Day. In America this is a classic holiday where we find the opportunity to grill and get drunk while having the vague acknowledgement that there might be a reason for why you are doing this other than that you have the day off of work. With Jen ready to give birth any minute we've had lots of dinner guests lately! 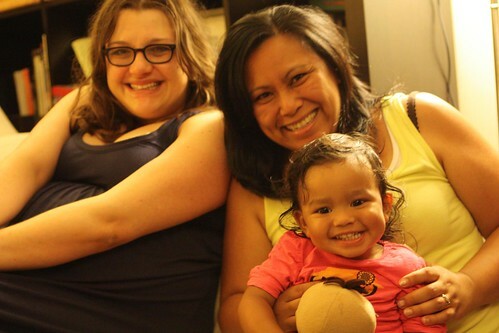 Tonight we conned our friend Mel & Jule into coming over with their kids. When your wife is on bed rest you can get all sort of people to do weird things! 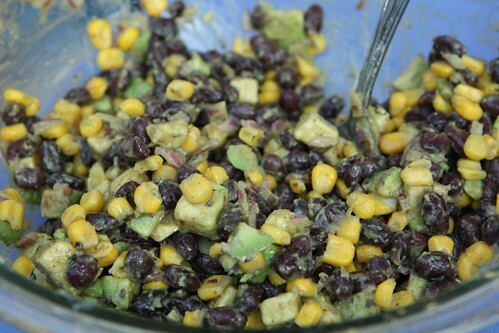 It was an exceptionally hot and humid night so I tried to make some refreshing dinner options starting with this black bean and avocado salad with corn, red onion, paprika, chili powder, cumin, salt, pepper, hot sauce, and olive oil. 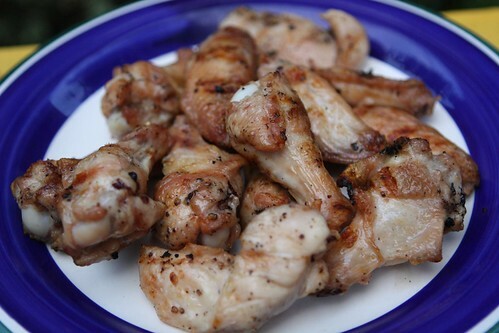 I also grilled up some chicken wings for the kids simply with salt and pepper. 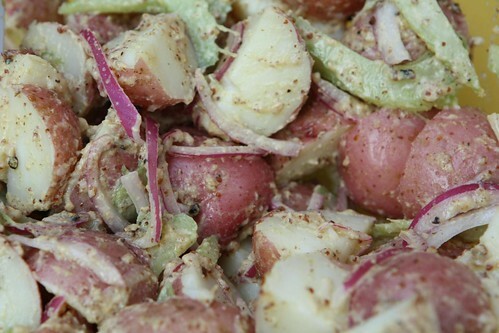 I also made this potato salad with boiled potato, Sierra Nevada Stout Mustard, sliced red onion, celery, olive oil salt, pepper, and hot sauce. 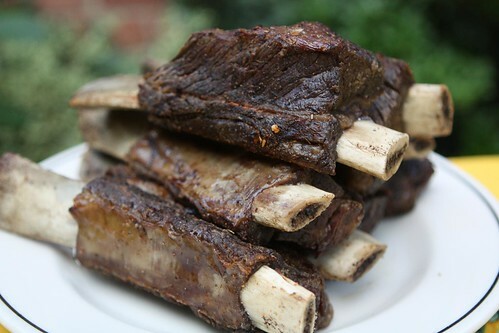 Last night I simmered these beef short ribs in a pot with crushed garlic, bay leaves, salt, and whole peppercorns until fork tender. Tonight I tossed it on the grill with a little extra seasoning and served it up with barbecue sauce. As I set dinner up I enjoyed this gw Beer from Connecticut. 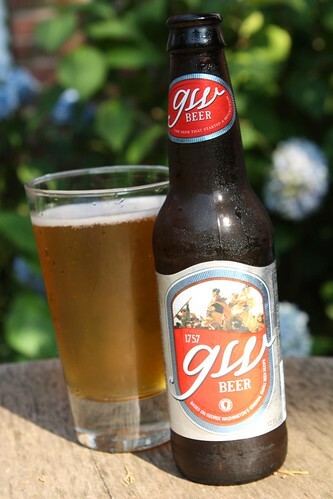 This beer is based on George Washington's recipe for small beer and seemed like a perfect beer to having on the anniversary of America's independence. Even better was the Dogfish Head 75 Minute IPA I cracked open after our guests arrived. After dinner we put our guests to work by making them assemble an auxiliary crib for the twins. This came not a moment too soon as there was a small patch of floor in our apartment that had not been taken over by baby furniture. While they guys slaved away the ladies enjoyed a nice night of coloring, posing for pictures, and barking out orders for the construction of the crib. Tonight was our last true Independence Day. After our dinner guests departed we were able to sit up for a while, drinking tea and enjoying the relative quiet of our apartment. Soon (very soon) our apartment will not be quiet and we will lose our independence. If our boys are half as good as the two kids who visited us tonight this will not be a a major loss. However, if Jen gives birth to two little shits then we will look longingly upon this day as one of our last days of true independence.